Our motorsport story began in 1957, when we completed the torturous Round Australia Rally. Since then, we have competed at the highest level of world motorsport, and succeeded in a wide variety of disciplines. Since that first Toyopet Crown model crossed the finish line in Australia, having completed an exhausting 17,000km in 19 days, our motorsport activities have proven to be the perfect test-bed for new technologies, materials and know-how, which filter down to road-going Toyotas. Just 12 years after the end of World War II, Japan was in the middle of remarkable economic growth. Its automobile industry was in its infancy with imported cars far out-numbering home produced, and manufacturing quality was still not at the same level. As a result, only a small minority in Japan had an interest in motorsport. Even so, a request came from the Japanese Consulate in Australia, through the Foreign Ministry, for a Japanese auto manufacturer to enter that year’s Round Australia Rally. Toyota responded, and Kunio Kaminomura, with Koujiro Kondo alongside him, took the wheel of our unproven 1.5-litre Crown saloon for 19 punishing days. Remarkably, a car heavily weighed down with extra fuel and spare parts, and with only 48 horsepower under the bonnet, completed the entire course without any major problems. Finishing a respectable 47th position overall, the Crown made it to the end, unlike 34 other cars from the 86 strong field, and we became the first Japanese car manufacturer to enter world motorsport. With increased enthusiasm for motorsport in Japan, and Toyotas hitting circuits around the globe, the swinging sixties was an exciting new chapter for Toyota and Japanese racing fans. Towards the end of the 1960s, sports car racing was changing. Cars were being fitted with ever-larger capacity engines and to stay competitive we produced our first purpose built racer in 1968: the Toyota 7. This first version, with its 3-litre V8 engine mounted centrally in the chassis was soon replaced with a 5-litre model that went on to finish a fine third in the 1969 Japanese Grand Prix. Then came the 1970s and car manufacturers focus began to shift away from racing. Anti-pollution policies were high on all the major car manufacturers agendas, and this resulted in the 1970 Japanese Grand Prix being cancelled, and with it our development of sports cars with large capacity engines. This was a real disappointment for Toyota racing fans the world over, as we had just released the world’s first turbo-powered racing car: the Toyota 7 Turbo. Worse was to come in 1973, as war in the Middle East triggered an international oil shortage that prompted many manufacturers to suspend racing. Having competed in touring car races since 1968, with the Corona model, this category became our focus, and we developed other road-going models to compete, such as the Corolla Levin, Starlet, and Celica Turbo which finished first in the 1973 Fuji 1000km race. After a difficult and unstable period in the early part of the 1970s, Japanese racing had a lot to look forward to. The first Formula 1 World Championship Grand Prix to be held in Japan took place at the Fuji Speedway in 1976 and 1977, and Formula 2 and Group C series races were well established in the country. During the early 1980s, our domestic racing activities consisted mainly of supporting private teams and club racers, but it was overseas that we were increasingly gaining momentum. In the World Rally Championship, our Corolla and Celica models were proving very competitive. Notable victories such as the Safari Rally in East Africa and a one-two finish in New Zealand formed the basis for a successful decade of rallying. In 1982 we began competing in the North American based International Motorsport Association series (IMSA), winning the GT class championship with the Celica Turbo in 1987. Back home, a new interTEC series for Group A touring cars had been established and was being hotly contested by Toyota-affiliated teams. Our Group A Supra Turbo enjoyed great success in this series with teams such as TOMS, which also entered the legendary Le Mans 24 Hour race in 1985. The late 1980s and early 1990s was a hugely popular time for world rallying. Fans loved that their idols were driving cars based on the production models they could buy in a showroom. Our Group A entry was the Celica GT-four which became increasingly successful, winning the Drivers’ Championship in 1990 and 1992, followed by both manufacturers’ and drivers titles in 1993 and 1994. Away from the mud and gravel of the World Rally Championship (WRC), we were competing on both sides of the Atlantic on circuits in endurance racing, and IMSA-GTP, the North American equivalent. In 1989, we began competing in the World Sport Prototype Championship and battled hard around the world’s circuits against Peugeot’s 905. Another notable achievement soon after was a fine second place in the 1993 Le Mans 24 Hour race. Through 1992 and 1993, the North American IMSA-GTP series was dominated by Dan Gurney’s AAR Eagle Toyota, who fought hard against other major manufacturer’s cars. Back in Japan, the new All Japan Touring Car Championship began in 1994, with 2-litre four door saloons competing over two short sprint races. We won the maiden championship with a Corona model, and once more in 1998, with a Chaser, which proved to be the final year of the series. Since 1975, Toyota Team Europe (TTE), under the direction of Ove Anderson, had been responsible for our World Rally Championship activities. In 1998, TTE broadened its focus to competing in the Le Mans 24 Hours race, although it nevertheless won our third WRC Manufacturers’ Championship in 1999. After an impressive debut in 1998, the innovative TS020 was denied victory in the 1999 race – despite starting from pole position – through bad luck, although one car did go on to finish in second position. As one of the first racing cars to be developed completely by computer-aided design, the TS020 was one of the most advanced racing cars on the world stage. A few years earlier in 1996, we became an engine supplier to the CART Champ Car series in North America. After tasting victory for the first time in 2000, it took a further two years before Cristiano Da Matta scooped our first drivers’ and manufacturers’ titles in the series. A year later, in 2003, we moved our supply across to the competing Indy Racing League where we made an immediate impression by winning the drivers’ title. The icing on a very successful 2003, was Gil de Ferran’s victory at the prestigious Indianapolis 500 race at the Indianapolis Motor Speedway, a first for a Japanese engine manufacturer. After success in some of the most prestigious motorsport events around the globe, in January 1999, we decided to enter the cutting-edge world of Formula 1 (F1). Toyota Motorsport GmbH (TMG), which ran the TTE team in WRC, was appointed to lead our F1 activities from its base in Cologne, Germany. Following successes in WRC and Le Mans 24 Hours, they initially undertook all chassis and engine development in Cologne, but the F1 programme was soon strengthened when engineers at our R&D department in Japan started working more closely with the team. Over nine hard-fought seasons in F1 we achieved several pole and podium positions, but disappointingly missed out on that elusive win. However, every point we earned in F1 was the result of a huge team effort and we performed impressively against teams with vast experience and top-level drivers. There were several highlights in our nine F1 seasons. From Mika Salo’s impressive sixth place at our first Grand Prix and Cristiano da Matta leading the British Grand Prix a year later, to both cars qualifying as high as third that year. But it was in 2005, with a driver pairing of Ralf Schumacher and Jarno Trulli, in a car that was performing well in the races, that we recorded our best results. Our first pole position, along with consistent point-scoring finishes and an impressive fourth place in the Constructor’s World Championship, proved that we were competing with the best. The TF109 of 2009, which was fast from the very start of the season – and earned Toyota a front row in Bahrain – proved to be the last car in our F1 campaign. Our focus then shifted to endurance racing and the 2012 World Endurance Championship (WEC). Returning to a championship that included the legendary race at Le Mans was one thing, but building a car that allowed us to showcase our hybrid technology, meant the revival of the WEC was the perfect fit for our racing activities. Now under the guise of Toyota Racing, the new TS030 HYBRID wowed fans with its petrol hybrid technology in the 2012 and 2013 seasons. Storing electrical energy, generated under braking, in a super-capacitor, this 300- horsepower electric-boost could be deployed under acceleration from corners to complement petrol power. Making use of TMG’s two wind tunnels, the TS030 HYBRID was designed so that all areas of the car were as aerodynamically efficient as possible. Racing on a wide variety of circuits throughout the year, it would need to perform at speeds as high as 330 km/h at Le Mans, and below 100 km/h on twisty bends at Interlagos, where downforce and grip are key. After two successful seasons in WEC, that saw us collect five wins, six poles and four fastest laps, the team entered the 2014 campaign full of confidence thanks to its newest challenger: The TS040 HYBRID. And what a historic year it would prove to be for the team and drivers. The new car’s reduced weight, increased power and 25% improvement in fuel efficiency (compared to the 2013 car), powered the 1,000PS, four-wheel drive TS040 HYBRID to victory in five of the eight races, taking four pole positions and enjoying 12 visits to the podium. Impressive stuff. 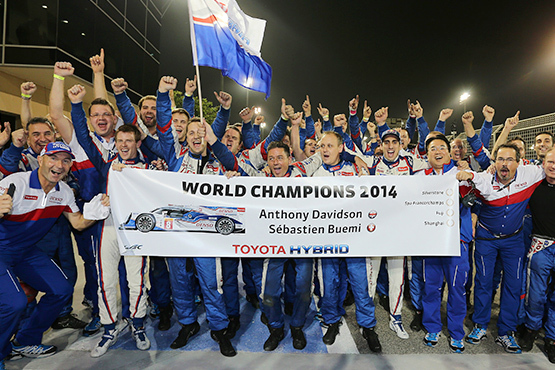 As a result, TOYOTA Racing drivers Anthony Davidson and Sébastien Buemi secured a much-deserved drivers’ title – Toyota’s first drivers’ World Championship crown since Didier Auriol won the World Rally Championship in 1994 – and the team won the 2014 World Endurance Championship manufacturers’ title, ending Toyota’s 15-year wait for a title. After a jubilant year, 2015 would prove to be more challenging for Toyota Gazoo Racing, the new name for the Toyota Racing team. Fierce competition from rival manufacturers – Porsche and Audi invested heavily over the winter to catch up – resulted in two hard-fought podium positions and third place in the Manufacturers’ World Championship for Toyota. In the Drivers’ World Championship, Buemi and Davidson in car #1 and Wurz, Conway and Sarrazin in the #2 finished the season on exactly the same points, but courtesy of more fourth place finishes, the #1 crew took the overall fifth place position. The #1 crew’s third driver Nakajima took seventh due to him missing the race in Spa through injury. The 2015 season finale was also the last race for the hugely successful TS040 HYBRID. In its two seasons competing, it completed over 16 races, winning five times and reaching the podium on 14 occasions. But it was time for a renewed effort to return to the front of the field. The car that’s targeted with taking Toyota back to the front of the field is the all-new TS050 HYBRID. To make the desired leap in performance, the team has gone back to the drawing board to produce a completely new concept. The jewel in the crown of the TS050 HYBRID is an all-new powertrain complete with an efficient 2.4-litre, twin-turbo V6 petrol engine mated to a more powerful hybrid system. Like Toyota road cars, the front and rear motor-generators recover energy under braking, storing it in a high-powered lithium-ion battery and releasing it as boost for maximum efficiency. Know-how from the TS050 HYBRID will be fed back into road car research and development processes, providing valuable information about hybrid technology in a high-performance applications. Thousands of hours in the wind-tunnel honing aerodynamics have also given our challenger a dramatic new look and, when combined with new cooling concepts, this means that virtually every aspect of the TS050 HYBRID’s chassis has been redesigned. However, only when the lights turn green on the opening race of the 2016 WEC calendar – the 6 Hours of Silverstone – will we know if all the hard work to return to the podium has been fruitful. As if all that wasn’t enough, 2016 also sees the final year of development and preparation for Toyota’s return to world rallying with the Yaris WRC. Featuring a new 1.6-litre turbo-charged, direct-injection engine that produces over 300hp, the Yaris WRC is set to light up the world stage in 2017.